Blue AutoMazar from Dutch Passion are autoflower cannabis seeds which are originated by crossing AutoBluebery x AutoMazar. These cannabis plants are one of the best autoflower strains from our assortment of this brand. 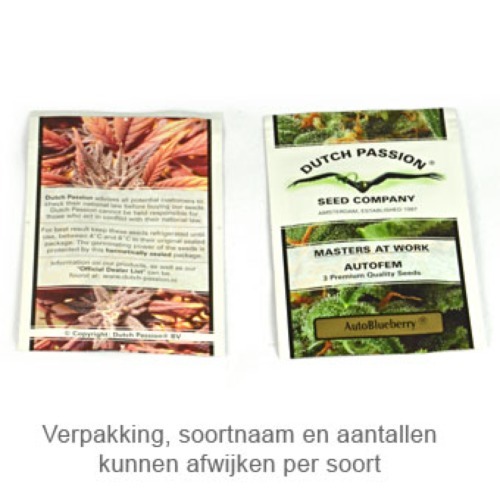 Dutch Passion Blue AutoMazar are suitable for an indoor and outdoor grow. During the bloom they generate a delicious fruity aroma with some spicy shades. These plants generate nice yields of buds which are covered with a thick layer of THC. The effect of smoking this tasteful weed is a strong high with a narcotic effect. These autoflower seeds are a recommendation for growers with experience who are looking for a very tasteful weed. Tell us and our customers what you think of the Blue AutoMazar from Dutch Passion.